Violinist Miriam Fried and pianist Jonathan Biss perform at the Isabella Stewart Gardner Museum on Sunday. 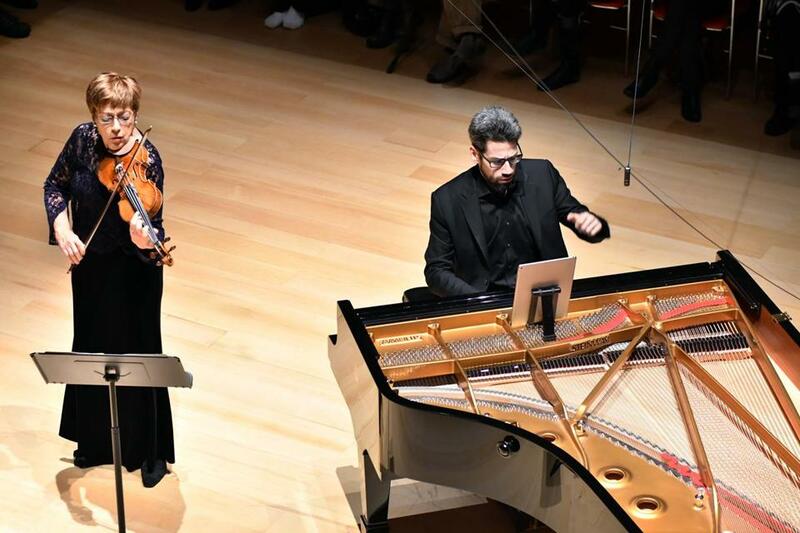 Violinist Miriam Fried and pianist Jonathan Biss began a two-concert exploration of music by Schumann and Bartok on Sunday at the Gardner Museum. It’s the kind of comparative, broad-view programming at which the Gardner excels. Yet it wasn’t clear, by the end of an enjoyable performance, what guiding thread made these two very different composers worth bringing together in the first place. Indeed, the program’s two pillars — each composer’s first violin sonatas — seem to point in almost irreconcilable directions. The Schumann is concise, darkly shaded, and constructed in a way that necessitates tight coordination between the two players. The Bartok, by contrast, is expansive, blazingly avant-garde for its time, and shot through with timbres so inventive that they have yet to lose their power to surprise. Yet as different as the two pieces were, they worked simply as an appealing program. In this case, opposites neither attracted nor repelled; they sat side by side, each content to say its peace. Fried and Biss are a mother-and-son partnership, so the affinity they demonstrated in the Schumann was unsurprising. The sonata is suffused with imitation and repetition, and keeping the sense of a larger dramatic arc alive requires careful work on the micro level. The duo excelled at this, passing lines and motifs back and forth in a way that propelled this restless, quietly seething music ever onward toward its goal. The Bartok, an apex of the composer’s embrace of modernism, dispenses with this paradigm and gives each instrumentalist largely dissimilar materials to work with, delighting in having them work at cross-purposes. Although Fried’s playing was not always technically secure, her bright, somewhat wiry tone served the music well by allowing her to cut through the piano’s kaleidoscopic rush of sound — now percussive, now atonal, now awash in muted colors. Overall, the performance highlighted the impressionist roots of the piece, with some of the harder edges smoothed over. It did, however, spotlight the tremendous control, depth, and expansiveness of Biss’s playing, and in the finale he and Fried let Bartok’s gypsy rhythms run gloriously riot. Between the two sonatas came Schumann’s Three Romances (Op. 94), originally written for oboe and piano. Eschewing virtuoso display, they allow careful listeners to marvel at how much craft goes into making their apparently simple melodies. They also offered the most purely beautiful music-making of the afternoon. The series concludes on Jan. 15.